Choose the Derofe Fine Writing Instruments Sterling Rollerball Pen for your personal or promotional gift. With extra smooth German rollerball delivering black ink, an elegant black gift box, print/engrave and spare Schmidt ceramic roller refill with 0.07mm nib and 500m capacity are included. 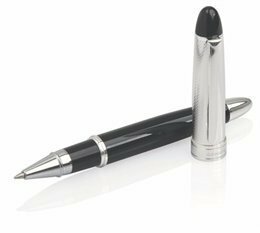 Finished in fine black with chrome trim, this precision writing instrument can be printed or laser engraved to celebrate your promotional logo or name on the upper barrel and can be ordered with DER117 as a set.